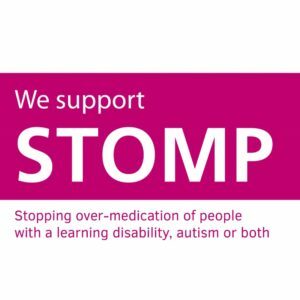 STOMP stands for stopping over-medication of people with a learning disability, autism or both with psychotropic medicines, and is a national project involving many different organisations which are helping to stop the over use of these medicines. STOMP is about helping people to stay well and have a good quality of life. In 2018 we signed up to the STOMP pledge, which includes commitments to actively explore alternatives to medication, and to work in partnership with people who have a learning disability and or autism and their carers to involve service users in decisions about the use of psychotropic medicines. We have also committed to ensure that all our frontline staff have both an understanding of psychotropic medication including the reasons for prescribing and likely side-effects, and that all staff can speak up if they have concerns that someone is receiving inappropriate medication. We have set up a number of dedicated STOMP clinics where individuals with a learning disability, autism or both can be referred by a GP or other healthcare professional for their medication to be reviewed in detail. The Monkwearmouth STOMP clinic has been recognised as a national centre of excellence, and has been visited by several other NHS Trusts who are looking to develop similar processes. STOMP is a national project managed by NHS England which aims to help people to stay well and have a good quality of life through reducing the over-use of psychotropic medicines – drugs which affect how the brain works. Find out more. An easy read guide about the STOMP campaign. Read about one service user’s experience of NTW’s STOMP clinics.